Consumer affairs programme. Identity fraud in the UK is at record levels, a visit to a shopping mall in Sweden that only sells recycled goods, and House of Fraser store closures. Department store chain House of Fraser is to close 31 of its 59 shops, affecting 6,000 jobs, as part of a rescue deal. If the plan is approved, 2,000 House of Fraser jobs will go, along with 4,000 brand and concession roles. The stores scheduled for closure include its flagship London Oxford Street store. We're live outside Oxford Street and will hear from shoppers plus a retail expert. Identity fraud in the UK has hit record levels. That's the warning from Cifas, the anti-fraud organisation which collects data from public and private sector organisations. Last year Cifas recorded nearly 175,000 cases of identity theft. That's a 125 percent increase on ten years ago. We hear from one of our listeners whose address was used to set up a fraudulent mobile phone account. We also speak to Sandra Peaston, Cifas' Director of Strategy, Policy and Insight, about why this sort of fraud is rising. A third of dog owners now feed their pets homemade food, either giving them scraps or cooking meals from scratch. That's according to the market research company, Mintel. Our reporter, Jay Unger, puts homemade food to the test by cooking a dog dinner's and trying it out on dogs in his local park. We also speak to Debora Robertson, the author of a new recipe book out today about cooking for your dog. But some vets warn against this go-it-alone approach to dog nutrition. House of Fraser are to close 31 out of 59 shops with 6,000 jobs. The Swedish shopping mall dedicated exclusively to recycled and upcycled goods. One listener got in touch about acting as a guarantor for their granddaughter. 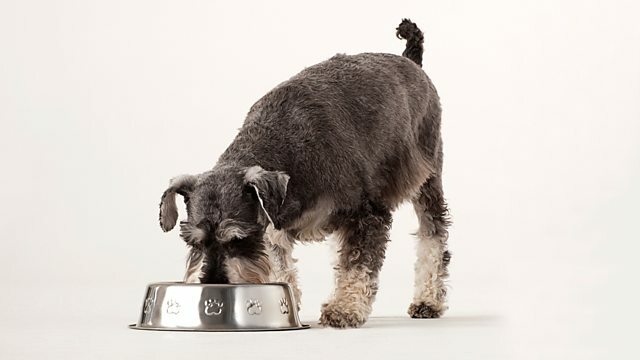 A third of dog owners don't by shop-bought dog food and actually cook food from scratch. What will happen if the prediction of widespread closure of betting shops comes true?